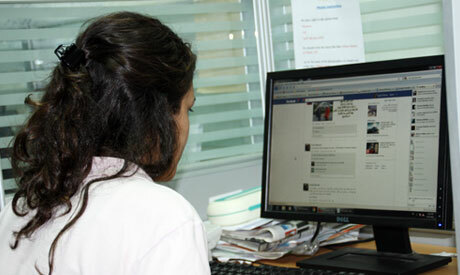 Egyptians now make up a quarter of total Facebook users across the Arab world, a report published this week shows. Egypt has a total of 11.3 million Facebook users, with 1.6 million new accounts created between January and June 2012, according to statistics from the Arab Social Media Report (ASMR). This makes Egypt, the Arab world's largest nation by population, also the region's biggest user of the popular social networking site. The Arab world had a total of 45.2 million Facebook users at the end of June 2012, the report says, up from 37.4 million in January. In June 2011, the figure stood at 29.8 million, suggesting an annual rise of 50 per cent. The report also shows the number of Arab world Facebook users has roughly tripled in the last two years, from 16 million in mid-2010 to 45 million this summer. Younger Arabs -- those aged between 15 and 29 years -- make up about 70 per cent of total Facebook users, a proportion that has held relatively steady. The United Arab Emirates comes top in per capita, followed by Kuwait and Qatar. Lebanon and Jordan are close beind. The report also reveals burgeoning use of fellow social media tool Twitter. It estimates the number of active Arab world users at the end of June 2012 at 2,099,706. In March of the same year, it says, the region generated over 172.5 million tweets. Statistics show the region creates around 5.75 million tweets per day, equivalent to 3,993 a minute, or 67 tweets every second. The Arab world's political uprisings have been the main focus of Twitter discussions, the report claims. The Arab Social Media Report, produced by the Dubai School of Government’s Governance and Innovation Program, analyses user trends across the Arab world. It compiles data on Facebook and Twitter use in all 22 Arab countries, in addition to Iran, Israel and Turkey.